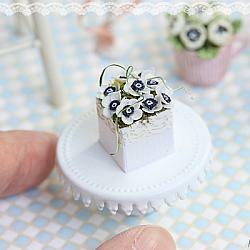 A beautiful stunning looking dollhouse miniature white anemone flowers presented in a pale pink box. In 1/12 scale. Flowers are handmade by me using air dry clay. 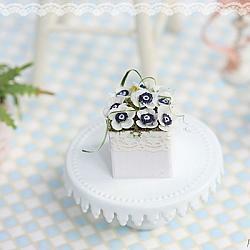 Flowers are all glued into the pale pink lace box. Please note that this purchase is only for the flower arrangement in the pale pink box. All other accessories such as cake stand is NOT included in the purchase. It measures about 1.9cm tall and 1.5cm at its widest.